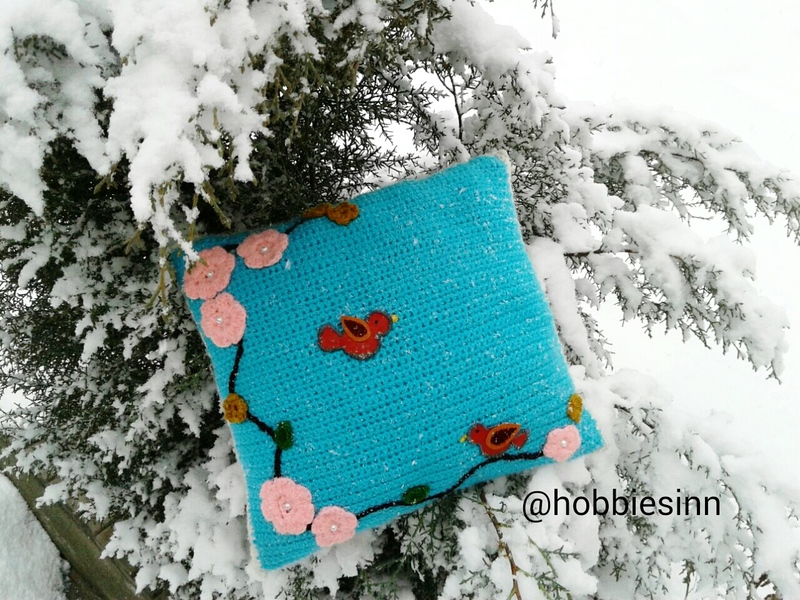 I did this pattern on one cold winter afternoon. I saved it, to share it in spring. I have put some beautiful pink blossoms and some fabric bird applique to decorate it with. It gives such warm and happy vibes. And it looks perfect on my favorite sofa. Its so easy that even a novice can do. In this pattern I'm using 3 ply cotton yarn in colors sky-blue, baby-pink, mustard, leaf-green and deep-chocolate and cream-white. Crochet hook of size 9 made of stainless steel. This pillow is an exact square of size 12 X 12 inches. I chose sky-blue for the base. Round 1: Chain 63. Start from the 4th stitch from the hook and make a row of plain double crochets. You must have total stitch count of 60. 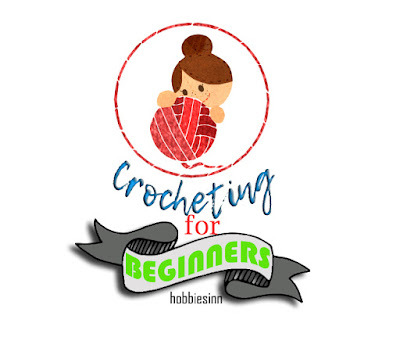 Note: If you don't know how to crochet you can easily learn it from here. It includes most important stitches for a beginner. Round 2 - 60: Chain 3. 1 double crochet stitch in each stitch. The border: Change the color of the yarn to cream-white. Make a border of single crochets all around. At the corners make 5 single crochets in each hole. Branch: Take a deep-chocolate color yarn and using a tapestry needle make a chain stitch on two edges of the blue patch in form of a branch. Flowers and leaves: I have already compiled a post regarding the flowers and the leaf in one of my slipper patterns-Click here to get to it. Birds: To make the little mustard flowers watch this video here. Just like me you too can use a little colorful bird applique to compliment the cushion. I have done a separate post to show how it is done step wise. Either crochet another patch of blue or use a fabric of your choice. Stitch it (whatever is your choice) to your patch from 3 and half sides. Stuff it. And after all the stuffing is done Sew the remaining half of the 4th side of your pillow to complete it. Update: If you want to increase the size of the cushion than add the number of stitches in the initial chain. The number of stitches depend upon the size you want to take. Also you must increase the number of rows too to the number of stitches. e.g. If you increased the number of stitches in chain to 70 i.e. 10 more than what we have made, than you must also increase the number of rows to 70 instead of keeping that to 60. This will ensure you have a perfect square. 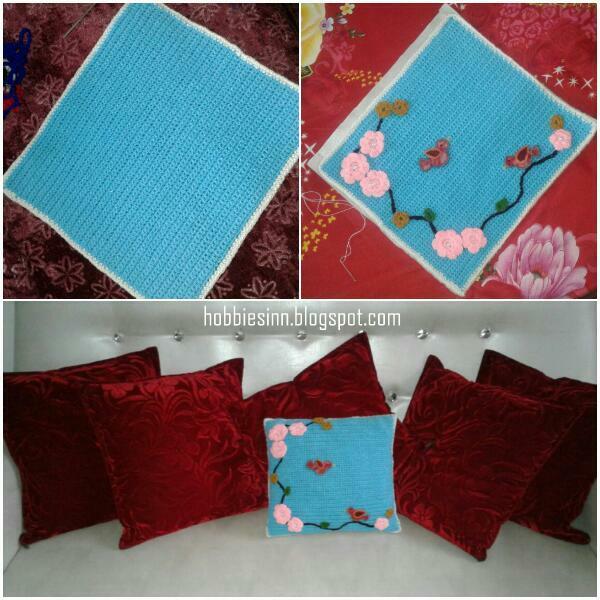 Moreover the size of cushion will depend upon the thickness and type of yarn and hook used. 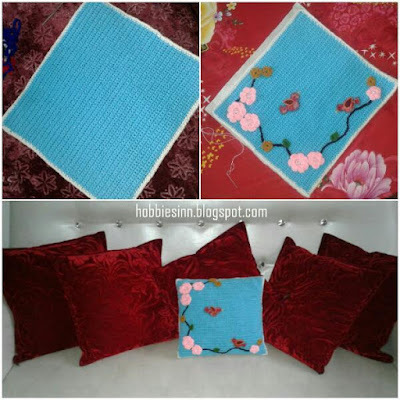 This pattern will remain same of all types, although number of stitches may vary. I hope you enjoyed reading this post. Subscribe, share and keep crocheting.